It was a case of déjà vu at the Peebles Golf Club Championship Finals on Saturday as Jamie Morris and Sheila Cuthbertson both chalked up another title success at the end of a superb week of golf over the Kirklands course. The scorching heat was matched by scintillating play over five days of knock-out golf, with the course looking more like an Open Championship links as golfers across six different categories went head to head in the club’s blue ribbon event. In the Men’s Championship, Jamie Morris made it ten wins in the space of just 21 years, overcoming the challenge of old rival Allan Turnbull in a superb final. The game ebbed and flowed over the first 18 holes with Morris recording no fewer than six birdies, but the match turned in Turnbull’s favour after the former Scotland international chipped in for birdie at 15 before Morris levelled at the halfway stage with a fine birdie on the 18th. The second round followed a similar pattern with Turnbull, looking for his first win since 1992, edging ahead early on. Ever the competitor, Morris battled back strongly and sealed victory number 10 by a 2&1 margin on the 35th hole to etch his name into the Peebles history books. On the Friday night, Morris earned a comfortable win over Jordan Lamb to reach the final, while Colin Fraser had put up a great fight with Turnbull in the other match, narrowly missing a birdie putt on the final green which would have taken the match to extra holes. 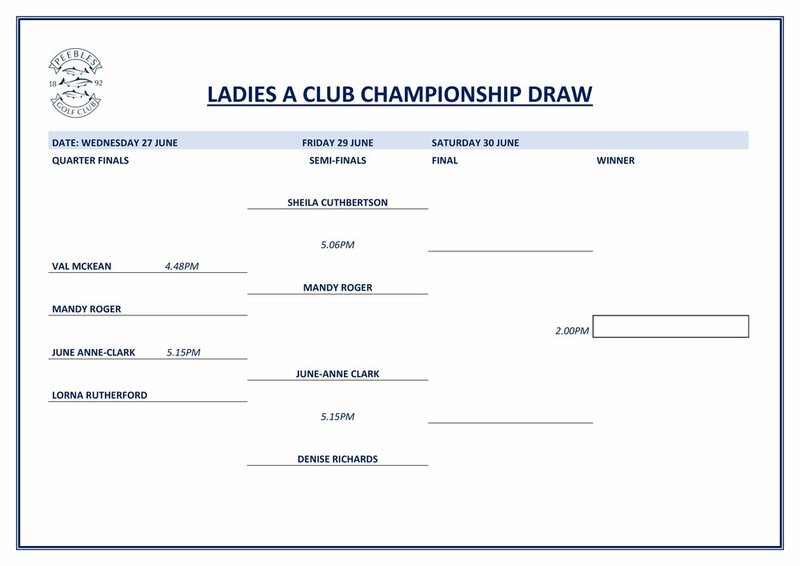 The Ladies Championship Final had a familiar look to it, with Sheila Cuthbertson battling hard to edge out Mandy Rodger in an excellent semi-final tie to earn her place against June-Ann Clark, who impressed with a comfortable 5&4 win over Denise Richards. Looking for her first ever title, Clark had a narrow lead at the halfway stage, but the experience of Cuthbertson – 51 years after winning her first championship – won the day, eventually closing out the match on the 17th hole. Experience was also to the fore in the Men’s B Championship, as 70-year-old Jimmy Nicol stormed through the field to take the title. The three-time Boys’ champion showed his class throughout the week, defeating Sam Anderson in the semis to set up a final with another member of the Clark family, June Ann’s husband Allen, who overcame the challenge of Davie McAllister on Friday evening. It was Nicol however who belied his age to earn a comfortable 4&3 win, much to the delight of his watching family and fellow pipe band members. There was a second successive Ladies B Championship success for Lillian Smith, who beat Mandi Bain 4&3 to lift the Laverock Cup, while the closest battle of the day came in the Men’s C Championship, as David Rusnack held off the challenge from Les Shortreed to clinch a popular win. Earlier in the day, the club saw a rising star clinch the Junior Championship title, with 7-handicap youngster Jack Kinghorn – younger brother of Scotland international Blair – storming to a 7&6 victory over Rueben Sterricks. Congratulations to both players on reaching the final and it was great to see such a strong field take part in this year’s knock-out stages, with more juniors coming through the ranks to challenge them next year. The future looks in good hands! The club would like to thanks the various volunteers who supported Championship Week through starting and refereeing and the fellow members who came out to support the players in the final. To see more photos and videos from Championship week, visit our Facebook page. GOOD LCUK TO ALL THOSE PLAYING IN THE SEMI-FINALS AND FINALS. HOPE TO SEE LOTS OF SUPPORT FOR THOSE COMPETING. Good luck to the those playing in the Gents Division A & B Quarter Finals and the Ladies B Semi Finals tonight. Good luck to all those who are through to the next round and the Gents and Ladies Division A's playing tonight. Good luck to all those who are through to the next round and those who are playing their first ties over the coming days. All applicants must have good IT skills, an interest in golf would be useful and a commitment to providing good customer service is essential. Peebles is consistently recognised as providing a warm welcome and the successful candidate must be able to demonstrate a commitment to service excellence. The post is integral to every aspect of Peebles Golf Club’s operation and is heavily relied upon by the members, visitors and staff. Applicants must be available to work occasional weekends. 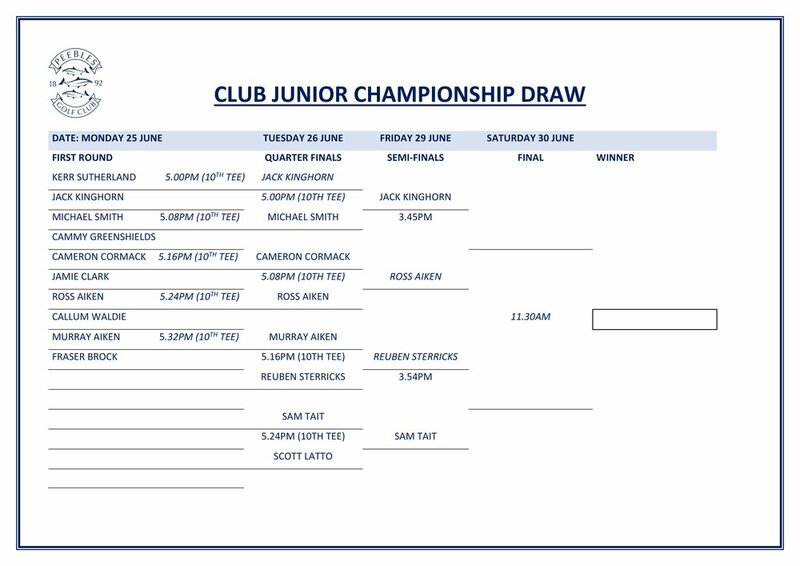 Congratulations to all golfers who have qualified for the knock-out stages of the Club Championship across our various categories, with matches being held from Monday 25 June through to our Finals Day on Saturday June. Should you require any further information on the Club Championship, please contact the office. We would encourage all members to come and support the players throughout the week or join in the celebrations at the presentation, taking place in the evening of Saturday 30 June. All Peebles members, prizes will be available to collect from behind the bar. All visitors who won prizes will have vouchers sent to their respective clubs. All those non members who won prizes will have them sent out to you this week. Hope to see you all again. Peebles Golf Club Ltd. will be a “controller” of the personal information that you provide to us in this form, unless otherwise stated. • equality information – disability (if any) and gender identity. • respond to and communicate with members regarding your questions, comments, support needs or complaints, concerns or allegations in relation to the Peebles Golf Club. As an affiliated club of Scottish Golf we are required to ensure that all of our members are members of Scottish Golf and the border golfers association (bga) as a condition of affiliation. We will share your name and membership category with Scottish Golf and bga who will become a controller of your personal information when they receive it. Scottish Golf’s privacy notice explains how they use your personal information and can be accessed here www.ScotlandSGB.org.uk/privacynotice. 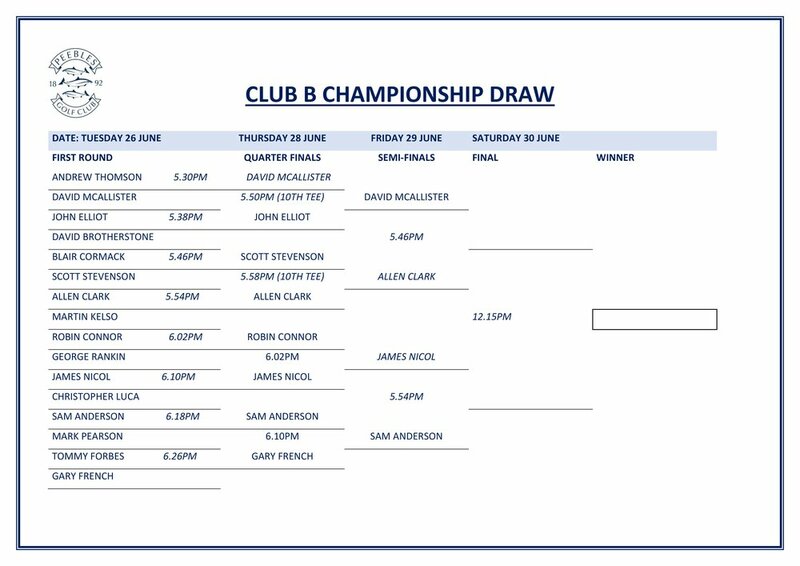 On Wednesday 16 May the club will be staging a qualifying competition for the R&A 9-Hole Championship, with the chance to win a place at Carnoustie in the final. This exciting new event will also be played in conjunction with the inaugural Maureen Haig Memorial Salver, open to women, women and juniors with a handicap limited of 36 and 28. • You may play alongside your partner but you cannot play as just a two-ball – you must compete within a three-ball with one other player. If competing in same group players in the same team must not give advice or mark each other’s card. • A player’s 9-Hole handicap allowance will be calculated by our club system’s software using the following formula. [Exact Handicap + Nine-Hole SSS – (Nine-Hole Par x2)] / 2. • The winning pairing will qualify to play in the R&A 9-Hole Championship Scottish Final which will take place at Milnathort Golf Club on 14 or 15 June (players can nominate their preferred date from the two date options). • The leading two teams from each day of the final, based on combined net stableford 9-hole scores, will win a place in the R&A 9-Hole Championship Final at Carnoustie on Saturday 14 July – on the eve of The Open Championship. Further details of the R&A 9-Hole Championship can be found on the link below. The draw for this season's knockout competitions has taken place. To find out who you are competing against please follow the relevant links below. Please play your ties before the deadline given, any issues please contact the office. Good luck to all those competing. Congratulations to the ‘young team’ of Cameron McBride, Jamie Fenton, Kris Hopkirk and Martin Walker who took victory in the Factory Cup with an impressive score of 125, beating off competition from 38 other teams. A great day at the club in glorious sunshine with another packed course and busy clubhouse. Well done to all those who took part in a wet and windy Gents Seniors Scramble yesterday. Glad you all enjoyed the course, hope to see the visitors again soon. Peebles members will be able to collect their prizes from the bar, we will be in contact with all victorious visitors. It proved to be a winning start to the season for the new Captain as Ross Duncan's side edged out Gavin Carruthers' troops by a margin of 11.5 - 8.5 to get the season officially underway the Spring sunshine. The course was in excellent condition for the time of year and with the lure of new caterer Gary Moore's Sunday carvery waiting back in the clubhouse, the pace of play proved to be very quick! A big thanks to our Piper Tracey Thomson for piping us in and out at the Millennium Cairn for the opening ceremony, and to David Brown, Gordon Sanderson and the Carruthers family for hosting the annual Jim Carruthers Memorial Walk. The entry fee for gent’s weekly competitions has been increased to £2.50. This is the first increase in over 20 years and will enable an increase in both prize money and the amount available for trophy engraving etc. We will also be introducing a new process for prize distribution. The current process of issuing club vouchers is inefficient for both club and Pro. In addition, we have members missing out on competition winnings due to non-collection of vouchers. A list of winners and values will be provided to the Pro as each Gents competition is closed. The Pro will credit the appropriate member account (as is currently the case with 2’s). Money won on a Saturday will be credited to an account by Monday. Money won in midweek competitions will be credited by Friday. Members will be advised via email that winnings have been credited to their Pro shop account. Notices of all competition scores will continue to be posted in the Gent Locker area. Scottish Golf Vouchers will continue to be issued for winnings gained at the Thorburn Cup, Centenary Trophy, Captains \ Vice Captains Trophy and all Open Competitions. The club has made further investment in the practice range with new short game tee areas and new yellow practice balls. Season tickets offer members a cost-effective, easy way to access the range facilities. There are two season ticket options available. How does the season ticket work? Ø A season ticket holder entitles the holder to 60 baskets of balls per month. The ticket holder receives two 30 square cards each month. A square is marked every time a range token is collected. Unused baskets cannot be carried forward to future months. Ø A maximum of two tokens can be collected from the pro shop or the bar at any one time (two squares marked). We don’t want tokens sitting in golf bags and glove boxes. Members are encouraged to only use one token at busy times – competitions days etc. Ø The season ticket is for the named user only and is strictly non-refundable and non-transferable. Abuse of the process will lead to the season ticket being voided. Ø Purchase of a DOUBLE season ticket will give access to unlimited range balls. Ø N.B. Yellow practice balls should only be used on the practice range or short game area. Use on the course or the area next to the 15th is not allowed. How do I get a season ticket? Application forms are available from the Office or the Pro. Once the form is completed and cash paid you will be issued with your April Cards. The draw has now been made for the Opening Scramble of the season on Saturday 24th March. Peebles Golf Club’s opening remembrance ceremony for the 2018 season will take place at the Millennium Cairn (the 9th tee) at the above time. All those wishing to participate, golfers and walkers, are requested to arrive no later than 11.00 am. Immediately after the ceremony, at around 11.10 am, the Jim Carruthers Memorial Walk - a popular addition to the opening weekend's activities in memory of the current Vice-Captain Gavin Carruthers' late father Jim - will begin for those who are not taking part in the Captain’s v Vice-Captain’s golf match. The walk is open to anyone, including children, whether golf club members or not. On this occasion, dogs will be allowed. From the cairn the route will go along March St, Venlaw High Road towards Glenbield, crossing the burn and returning via Soonhope, Kerfield and the Gytes. Total distance about 5.5 miles (2.5 - 3 hours). Even if the golf is postponed because of unplayable conditions, a walk will hopefully go ahead on the above date. We do not intend to organise a walk on any subsequent day. There is no definite plan to return to the clubhouse car park by a particular time. However, any walkers who wish to visit the clubhouse for food and refreshments are welcome to do so. A suitable change of footwear should be brought. For further information, please contact Gordon Sanderson (tel. 720511) or David Brown (721680). 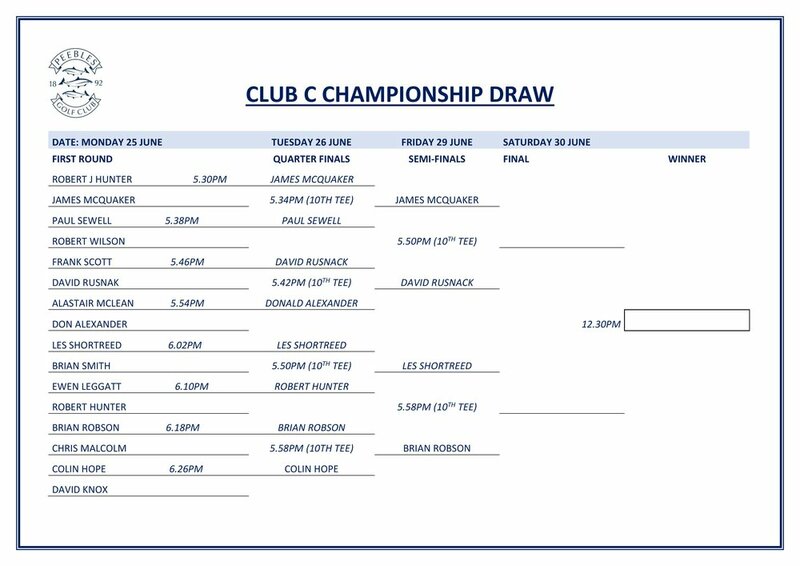 The draw has now been made for the Captain's v Vice-Captain's Team Challenge, taking place on the second day of our opening weekend on Sunday 25 March. The matches will commence with a shotgun start at 11.30am following the official opening of the new season at the Millennium Cairn on the 9th tee at 11.00am. We would encourage all players and other members to join us for the opening ceremony. For those not taking part in the match, there is the option of the annual Jim Carruthers Memorial Walk, led by Gordon Sanderson and Davie Brown, which will make its way around their walking route before joining the golfers back at the clubhouse for food and drinks and the presentation of the trophy.